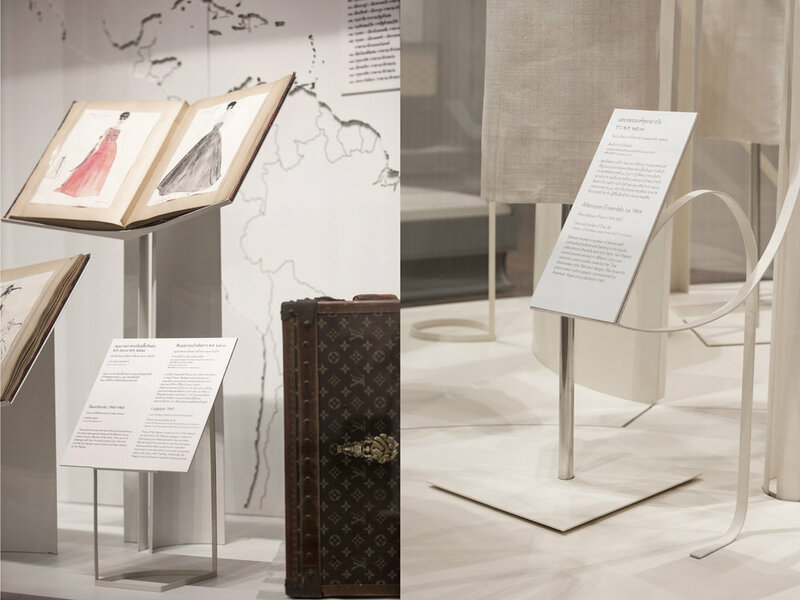 The exhibition features Her Majesty’s working relationship with the French couturier Pierre Balmain that had impressively spanned slightly over two decades, showing the design sketches and embroidery swatches lent by Balmain S.A. and the House of Lesage, and most significantly Her Majesty’s dresses & accessories, most never displayed before. The color scheme of the wall is set in the light tone upon entering. As visitors move towards the end of the exhibition, the color scheme gradually changes to a darker tone corresponding to the display of Her Majesty’s day wear to evening wear. The wall of the ‘Day’ gallery is overlaid with thin iridescent-white aluminum strips that gradually shift the mounting angles to create gentle rippling effects resembling that of a flowing fabric. The wall of the ‘Night’ gallery is mounted with vertical midnight-blue aluminum fins where each of the fins’ rotation can be individually steered and fixed to reveal the gradation of white stripes carefully positioned to accentuate the midnight glow of the finale ball gowns. By subtly adding more depth and texture to the wall surfaces, sound reverberation quality improves while adding a unique visual definition to the background. The play of surface depth and texture carries through to the design of the in-case display platforms and back panels. Curved lines and surfaces in many key components such as Partition panels, object mounts, and label stand set up a continuous and organic visual flow throughout the exhibition while giving a smooth gradation of light around the objects.